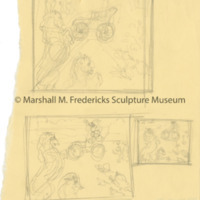 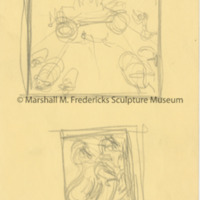 Sketch for "Horseless Carriage (Model S. Ford, Children and Animals - Sunday Afternoon)"
Fredericks received this commission as a result of an honorable mention in a section of Fine Arts Competition at the World’s Fair in New York in 1939. 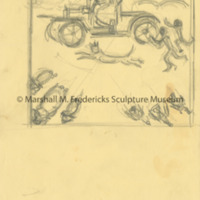 He carved the original limestone relief that was placed in the public lobby of the Post Office in River Rouge, Michigan. 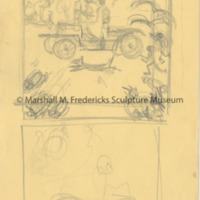 Sketches for "Horseless Carriage (Model S. Ford, Children and Animals - Sunday Afternoon)"
public lobby of the Post Office in River Rouge, Michigan.